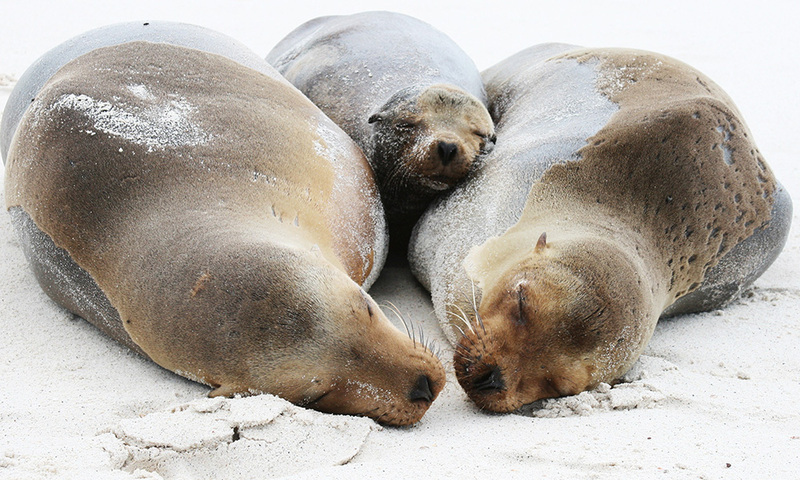 The most abundant marine mammal in the Archipelago, Galapagos sea lions can often be seen sleeping on the beaches or swimming close to shore. 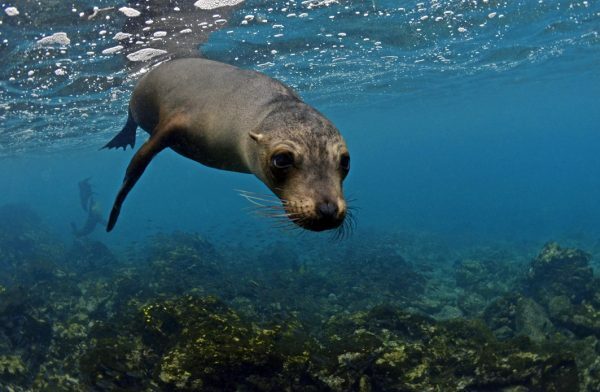 The Galapagos sea lion is a species that primarily breeds in the Galapagos Islands, although some breeding colonies also occur on Isla de la Plata just off of mainland Ecuador. They are one of two types of seal found in Galapagos and are part of the eared seal family – having external ear pinnae. They are not ‘true’ seals, as they are able to rotate their hind flipper under their pelvic girdle and lack the characteristic long, finger-like claws of true seals. The configuration of their pelvic girdle allows them to ‘gallop’ across land, reaching speeds exceeding that of a running person on rocky terrain. There is a large degree of sexual dimorphism, with males weighing up to four times that of females. The males also have a prominent bump on their forehead, making them easy to distinguish from the females. All members of this species have brown or grey fur, females generally being a lighter shade than males, and newborn pups being chestnut brown. The sea lions have a smooth and streamlined body shape, making them efficient hunters, especially of sardines which are their main prey. They can dive to depths of up to almost 600 m and can stay underwater for over ten minutes. They spend a lot of their time resting on beaches or playing, and are generally inquisitive. Males tend to hold territories on beaches where females live, as opposed to holding direct harems. The more dominant the male is, the more land he has in his territory, and therefore the more females are available for him to mate with. The bulls aggressively defend these territories from other male rivals or interlopers, and the bulls that don’t manage to acquire a territory containing females tend to form bachelor colonies away from the female haul outs. The mating season usually occurs between July and December, but can differ from island to island. Females come into oestrus three to four weeks after pupping, when they will mate with the males, however implantation of the fertilised egg is delayed for two months. After the single pup is born, it bonds with its mother for the first week, developing a unique call to distinguish it from the rest. The mother then starts to forage by day and suckle the pup in the evening, until the fifth week when the pup moults its baby coat and begins to feed inshore. Pups are still dependent on their mothers for the first year of their life, being weaned when they reach eleven to twelve months old. Find out more about how Galapagos sea lions have adapted to their environment in this article from Galapagos Matters. Where to see them: In Galapagos, they are widespread along the coastline. 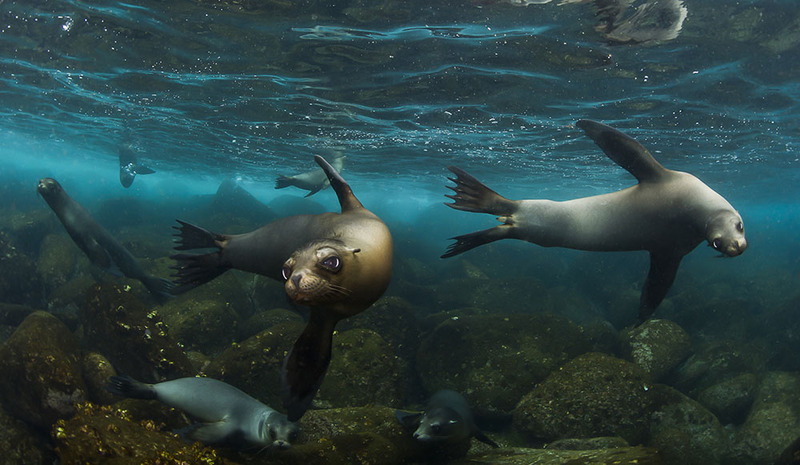 When to see them: Galapagos sea lions stay in the Galapagos Islands all year round, rarely migrating. Threats: Their natural predators are sharks and killer whales, but the main threat to their status is the El Niño event which causes collapses in the marine life upon which the sea lions are dependent. 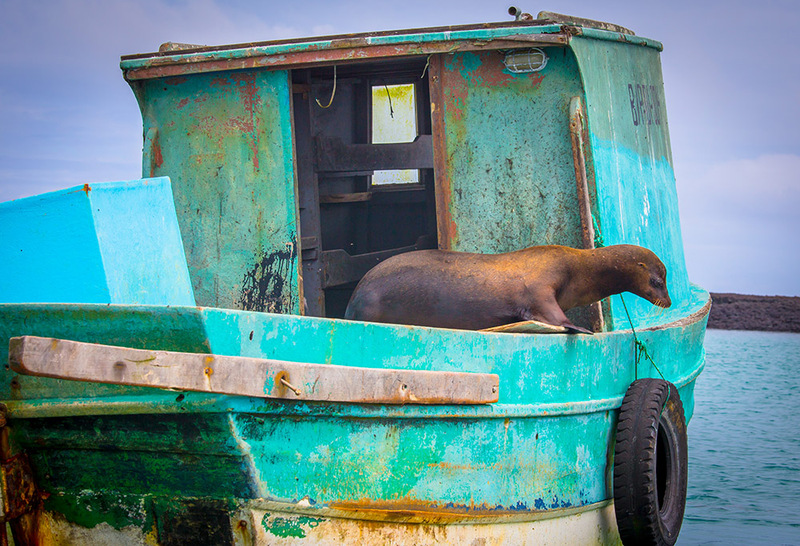 Recent studies have suggested that human activity may also be a threat to Galapagos sea lion numbers. 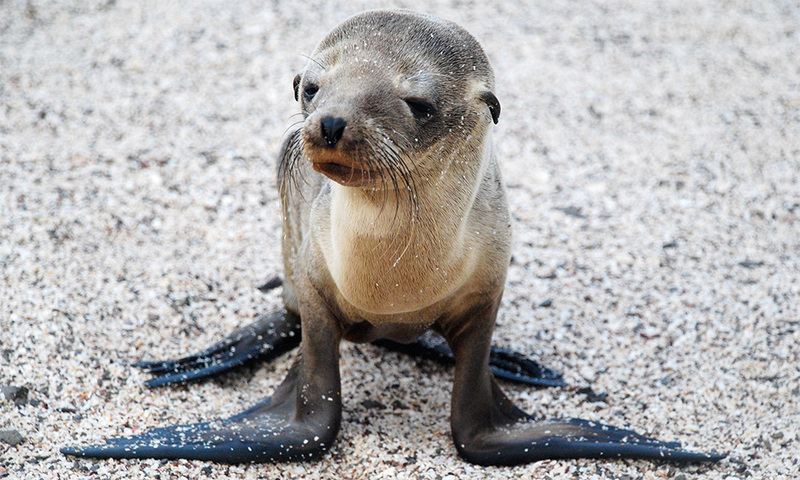 Domestic dogs transmit diseases to sea lion colonies, causing further population declines. They are also at risk from marine plastic pollution. Conservation Actions: The are currently no projects specifically focused on the conservation of the Galapagos sea lion but we are investigating the risks of plastic pollution on marine life in Galapagos, including sea lions which have been seen entangled by plastic. Help us to protect the Galapagos sea lion today by donating to our Plastic Pollution Free Galapagos programme! 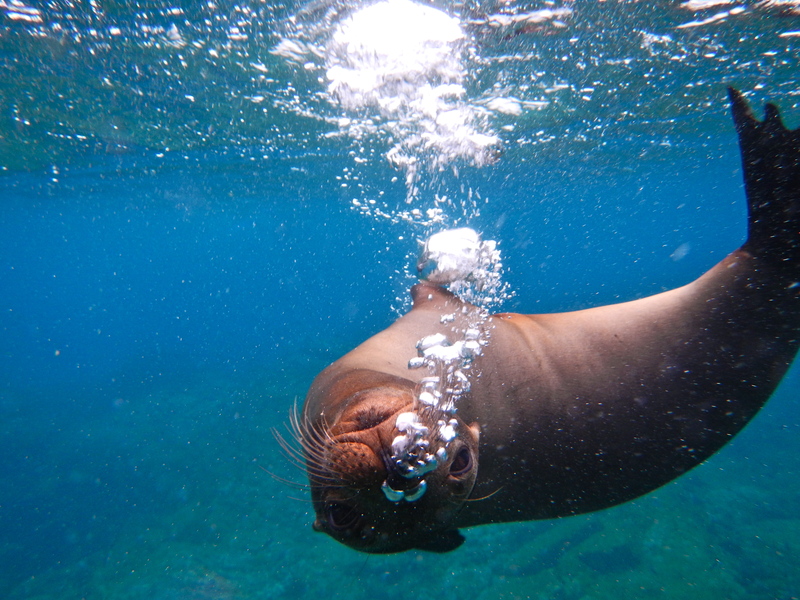 Find out about the adaptations that allow Galapagos sea lions and other marine mammals to make long and deep dives. Fur Seal or Sea Lion?